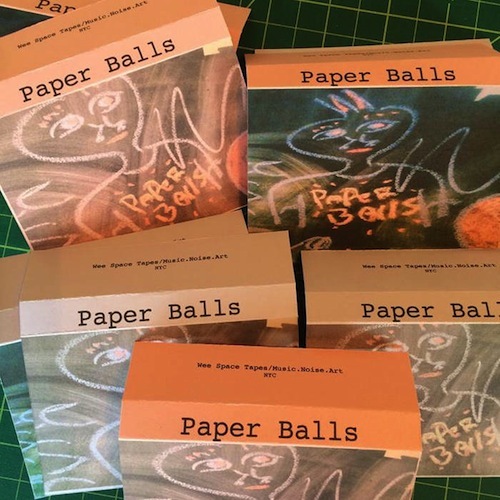 It’s hard to identify what Paper Balls is all about. An improv trio comprised of two guitars, percussion, and apparently random screams and vocalizations. It’s a cluttered cacophony of sounds that bombards your ears in all directions before veering off into some particularly meditative drones. It’s almost like a found sound Bitchin’ Bajas or something like that, the type of thing that takes what William Basinski or, to a lesser degree, Brian Eno does and makes a sonic collage of sorts, a pastiche of tones and harmonies that incorporates found sound. The first track titled No Emotion may then imply the same, that this is a series of sounds assembled as some kind of avant garde audio experimentation, but that’s not quite true. There is a tension that never really lets up. It’s ugly at times and serene at others. It’s simultaneously busy and slow, however you may reconcile that image. So it makes sense that they trio are playing at Dreamland this Saturday for what promises to be a memorable set. You can listen below and get ready to get weird.